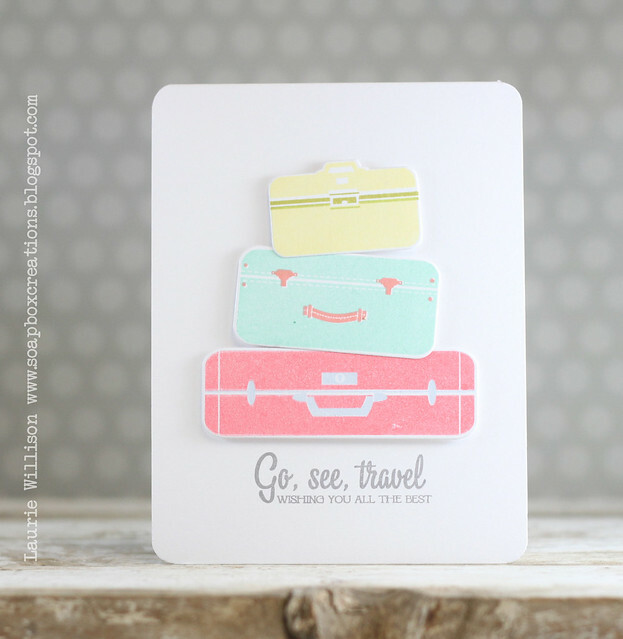 I am totally loving the travel theme of this month's Papertrey Ink Release. If I could, I would travel all the time. I'd even live in an RV if my husband would let me....but he won't. So instead, I am stopping in today with 3 cards about traveling. 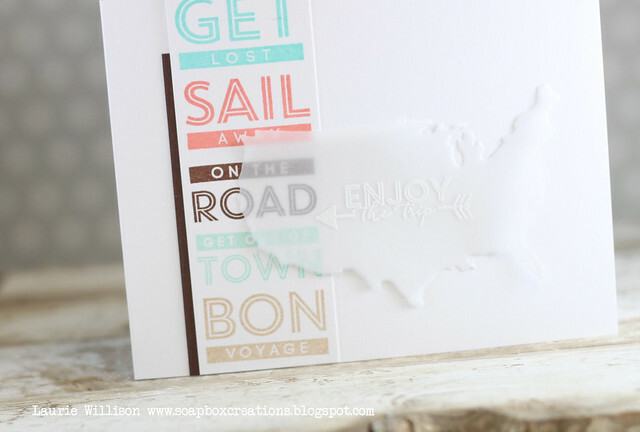 And then I used the US die cut and heat embossed another sentiment in the center. I tucked some Dark Chocolate behind the panel for a little contrast. I did cut the card down just a tad, so the panel would stick up just a little. This set is called Pack Your Bags. It has a great set of coordinating dies to go with it as well. 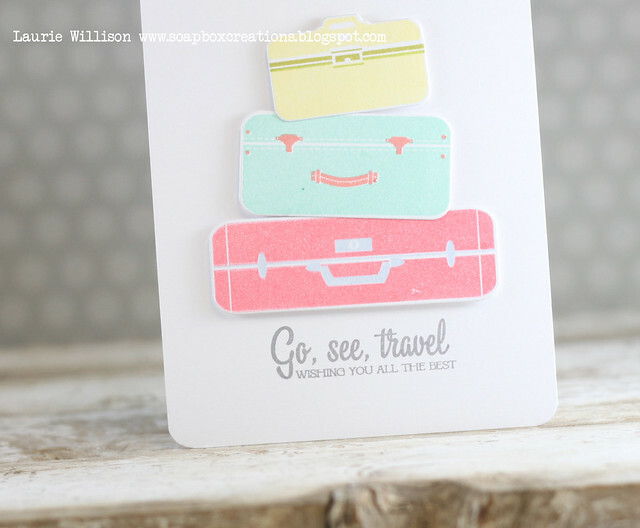 I cut out 3 suitcase dies and then stamped them each in a different color. The 2-step stamping for the handles is so easy to line up and so much fun! 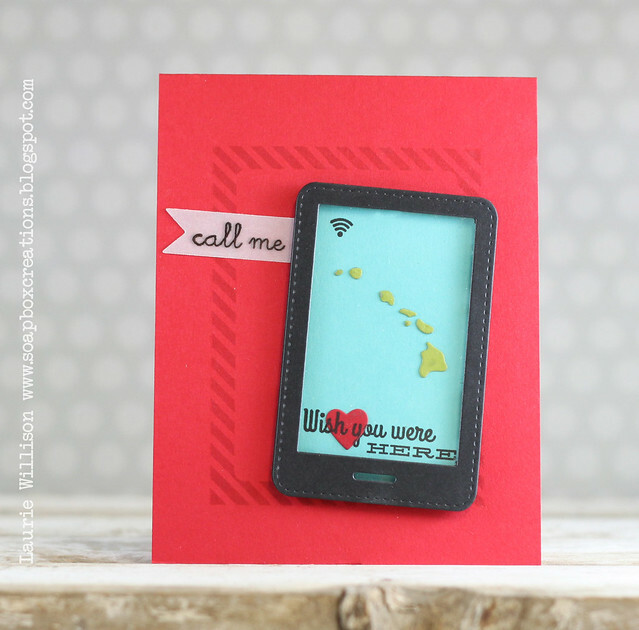 I used an element from the Monthly Moments: Travel Plans, in the background and then made a little map using the Hawaii die. I stamped the sentiment from These United States and added in a little heart. I added in the "call me" sentiment from Desktop Design on a vellum banner to finish it off. OH, I added in the little signal bar, also from Monthly Moments: Travel Plans, just to give it a fun little phone element. That is is for me today! There is lots more fun stuff to come to I hope you come back again tomorrow! Have a great day! FAB cards Laurie as usual! LOVE the phone you made too - way to extend the life out of the die. Completely saw the phone...I am in love! Those suitcases are so darn cute! Very clever :) Fabulous cards! 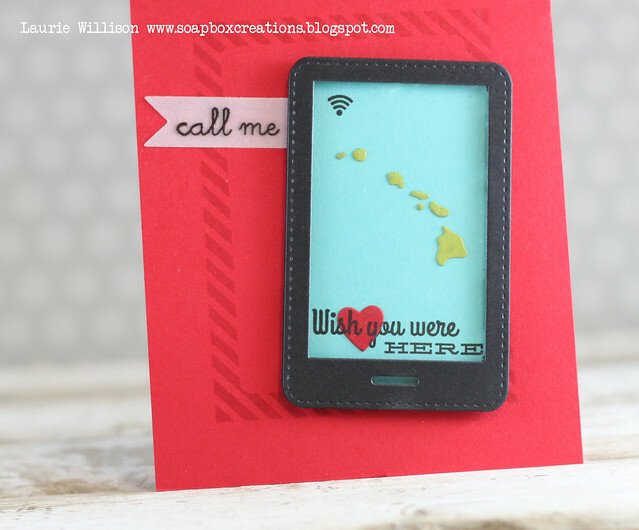 Love all your cards from the elegant vellum U.S. to the soft colored suitcases to the amazing phone (and what better place to be than the Hawaiian islands). I am so going to use that tag to make a phone. VERY cute cards Laurie, LOVE the phone! Seriously clever making the tag die into a phone! That whole card is an awesome concept! Super cute. Your Aqua suitcase looks like a smiley face!!!! I love all of these, Laurie! Fabulous cards! Wow! A vellum contiguous USA. Great look. All projects are extremely well done and highly creative. So much fun going on. Love every single one of these cards. What fabulous cards!! I love each and every one of them!! All your details are fantastic! Super cute! Love them all. Love your phone card, so very clever! Laurie these are all fabulous! 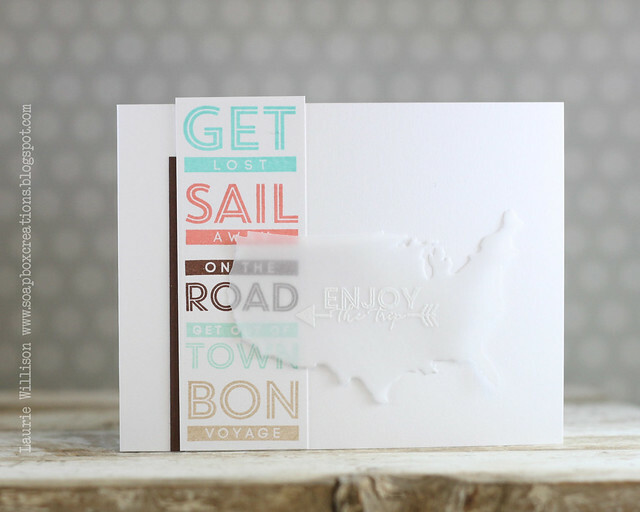 Love the USA diecut from the vellum! And the suitcases are just so fun! These are wonderful! I especially love that last card with the phone and Hawaii. Perfect! Really like the use of the sentiments down one side of the card with the USA die. Stunning look. These are all cute! Love the little phone card! Hi Laurie! FeedBurner is not sending out your email subscriptions, for at least a month now, nor will it let me resubscribe. Thanks! Miss your posts. Love the Wet Paint Alphabet card. If I could go anywhere in the world, I'd go to Ireland in the back country and just relax. W&W Hello and a giveaway! !